Our planet is important to you. Being ecologically sound is part of your corporate culture. At E&E Exhibit Solutions, we understand and that’s why we offer a complete line of green trade show displays, accessories and green graphics. Together we can help save the environment with our eco-friendly green graphics and green displays. Our complete line of green graphics, green displays and green banner stands are made of the same durable, quality construction as our regular exhibit components. 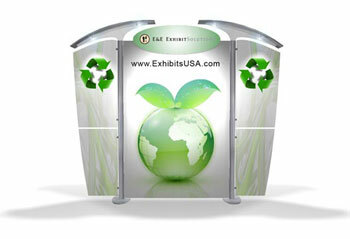 Green Graphics-How Are E&E Exhibit Solutions Graphics Eco-Friendly? For more information about your complete line of green Graphics and green displays visit our Green Exhibits FAQ. We also offer a complete line of green rental products. Visit our exhibit rentals website for more information.